As reported elsewhere , we have been in contact with the Southern Downs Regional Council , re the use of either Stanthorpe or Warwick airstrip . Chris Hanlon sent a well pesented letter ( actually we sent a copy to every councillor and the mayor ) . The councils chief engineer has to report back to the council on our request . We are having a meeting with the chief engineer this Thursday 31st July at Warwick ( where the councils head office is ) . Also the engineer from Stanthorpe will be attending too . 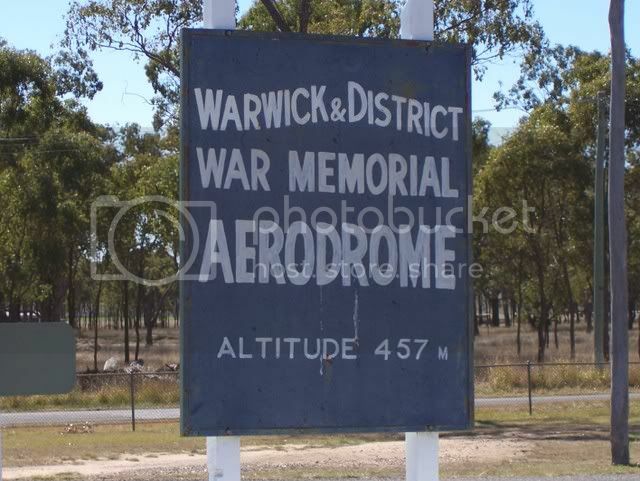 We will all be going out to Warwick airstrip for an inspection with the engineers . Those going from the DLRA are Bob Ellis , Paul Lynch and myselfe . Chris Hanlon and Mathew Saunders may be coming too . Wooo Hooo , we will be waiting to hear the outcome ,hopeing they see the commercial potential of a heap of people decending on town for the weekend. Sorry I won't be there,I'll be at Winton for the the weekend and I'd appreciate it if you can order fine and sunny 21 degs thanks Greg. The QTA team will attend the meeting and with the combined charm of Paul and Don with Bob attending we would best pray for a positive outcome. We must understand that councils seem to operate on a different timetable and might not fully understand our need for speed so we should always show patience and understanding. Good luck guys and find out what he drinks. Bring the wets for practice, should be fine race day though. I'd come over and check out the action but for the final shakedown of my Bonneville setup , having trouble with clutches and Heathcote Sunday is the last chance to test before boxing it all up . Yesterday , Thursday 31st July , we had our meeting with the Southern Downs Regional Council . As stated above the Chief Engineer has to prepare a report for the Council committee meeting . One of us will have to attend this meeting to answer any extra questions raised . We all believe we had a very good response from the engineers , with positives in the majority , with plenty of information going both ways . Bob left the engineers a folder of pics of our race vehicles . We left them a copy of the speedweek operational plan to further show our activities . When we were questioned on a time frame , we suggested October for our first event , which didnt seem to pose any problem , pending approval for use of the airstrip by the main council meeting . After the meeting , we were escorted out to the Warwick airstrip , approx 8 kms out of town . We were given permission to drive along the airstrip to do an inspection . We took pics and did a few measurements using gps . None of us had seen the airstrip before , and we are pleased with what we saw . Theres not a lot of facilities out there , but at least there is a small terminal building with toilets . We were told , camping would be allowed adjacent to the airstrip . The Engineering committee meets . Southern Downs Council meeting makes a decision . We feel quietly confident at this stage . Looking at Google Earth, the runway is just about 1 mile long? Nice bit of tar mind you! What would be your ideas for a run up / timing trap / braking distance? Dreamliner 200 wrote: Looking at Google Earth, the runway is just about 1 mile long? Run up length to be worked out after test run , whatevers safest , we will trial 800 -1000 mtrs which mean braking would be 800-600 mtrs , timing trap .. short , depends on the timing equip we use . The council for the area has a Horsepower theme - both the four legged and engine kind and they seem open to building on this, so there is hope. he got beaten to it! The might Suzi has done the first run, with hazards on, in the left lane, with 3 up, at approx. 40ks per hour!!!! The challenge has been set, do your worst!! I must add that we were on display and expected to be on good behaviour so I wasn't allowed to shred the bitumen! That is one thing the council guys will be watching as well, the event can't deteriorate into a burnout comp. 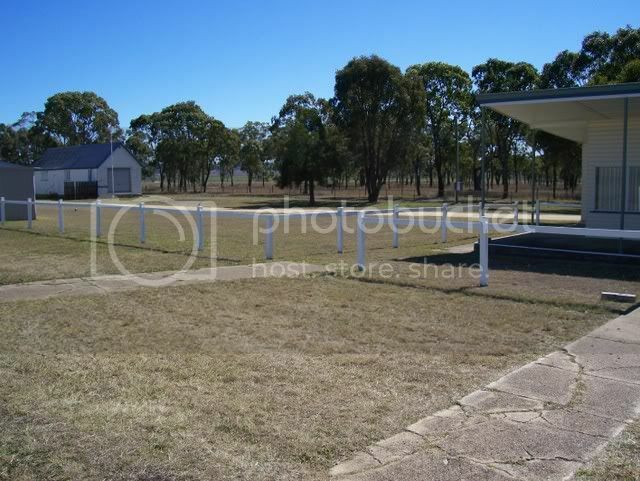 There is a lot of land around the strip and there are a few houses nearby, the council guys indicated that this would be a possible camping area. The building on the right is the aero club and this is where the toilets and a pay phone are. 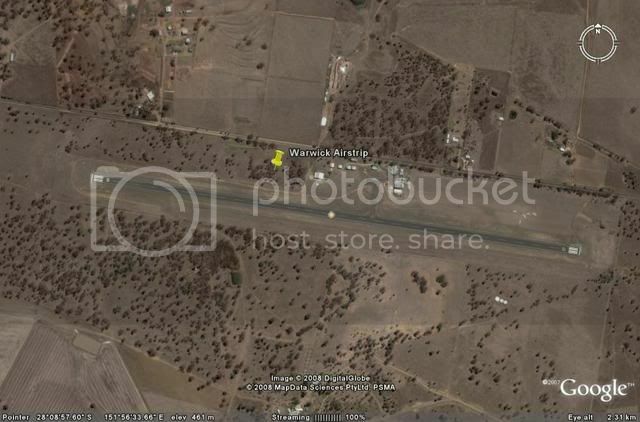 The little shed to the far left is where Avgas is stored so I wouldn't be cooking too close to that. There's a dirt road you can just see above the white fence that runs through this area. It is fairly small so if we got a crowd we might move down to one end of the strip away from everything else. Here's an aerial shot with North being up. The strip runs East - West and we would likely start from the eastern end as the western end curves uphill a bit and would aid stopping. The taxiway connects to the strip 800m from what would be the start and the traps would be a little further left around about where you see that last building. Then about 600m to slow down. So we would trial a few cars to see what was a safe slowdown distance and position the traps between the taxiway and the last building. The strip is 24m wide which is just a little narrower than the marked width of the lake. It has a bit of fall from left to right at the eastern end and it dips around the 900m mark and starts to rise back up at the western end (you can see this in Don's shots). Bob wanted me to thank Greg Wapling for the work he did in assisting us with information prior to the roadtrip. Thanks! So - wait and see. Thanks for that , will help us determine when to throw out the anchor out . Some cars are only running rear brakes and some are obviously a lot faster than others . 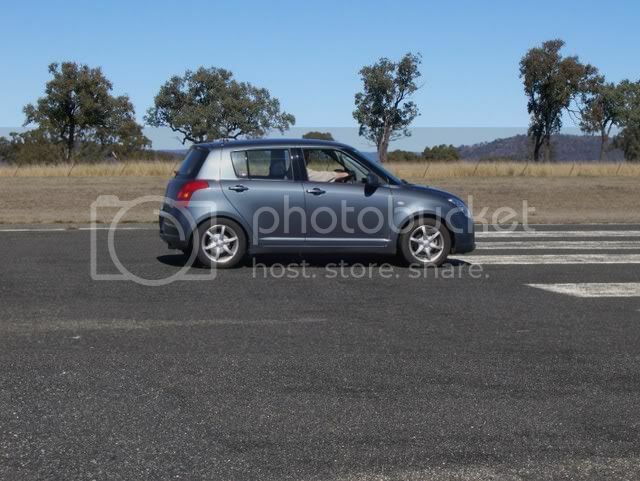 maybe we can have different length of courses for different type of vehicles .We dont really want to test the strength of the fence past the end of the runway , like a Subaru driver did last year at the the Dutton rally event .